RG told me the other day that he was craving for some lasagna. So I remembered to buy some lasagna noodles when I went to Shaws. Yesterday, I decided to make it for dinner. Being lazy, I didn't follow any recipe. I opened the fridge and just grabbed whatever I could lay my hands on that could possibly work for a lasagna. So out came - what's left of a rotisserie chicken, 3/4 of a bottle of pasta sauce, some cottage cheese, mozarella cheese, parmesan cheese & some chicken stock. I also grabbed a small white onion, a few garlic cloves....and for seasoning, I chose Italian seasoning & parsley flakes. 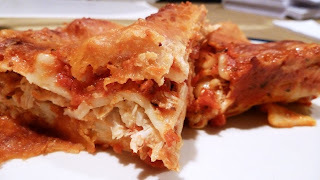 So this is just my version of the lasagna based on what I had in my fridge......you can use anything that works for you i.e. instead of rotisserie chicken, you can use minced meats or mashed meatballs/sausages....you can use cream/ricotta/cheddar cheese instead of cottage...you can make your own tomato sauce instead of using bottled pasta sauce...you can use other spices like thyme, garlic/onion powder etc etc. You get the picture? Just do whatever you please to suit your taste buds....hence the title "ANYTHING-GOES-LASAGNA". Since it was spur of the moment kinda cooking....I obviously didn't care to be exact with my measurements. Just taste, taste and taste to get the desired results. First I boiled the lasagna noodles till soft and cooked. Rinsed them with cold water and then set aside. Next I tore apart my rotisserie chicken with 2 forks to yield about 2-3 cups of shredded chicken. Then I finely chopped my onion and garlic. I heated up my pan over the stove on medium-high heat and added some EVOO. I stir fried the onion and garlic until I could smell the fragrance and I added the shredded chicken, some chicken stock, dash of salt/pepper, italian seasoning, parsley flakes to stir fry till heated thoroughly. Next, in a large bowl, I added approx half a tub (8-10oz) of cottage cheese, approx 1 cup of mozarella cheese...and then I stirred in the chicken mixture while it was still hot. I mixed till the chicken and cheeses were well-mixed & all the cheeses melted. Finally, it was time to put together the lasagna. I spread a few tbsps of pasta sauce at the bottom of the baking dish. Then I laid the cooked lasagna noodles on the sauce. On the noodles, I added the chicken/cheese mixture and then topped with more pasta sauce. 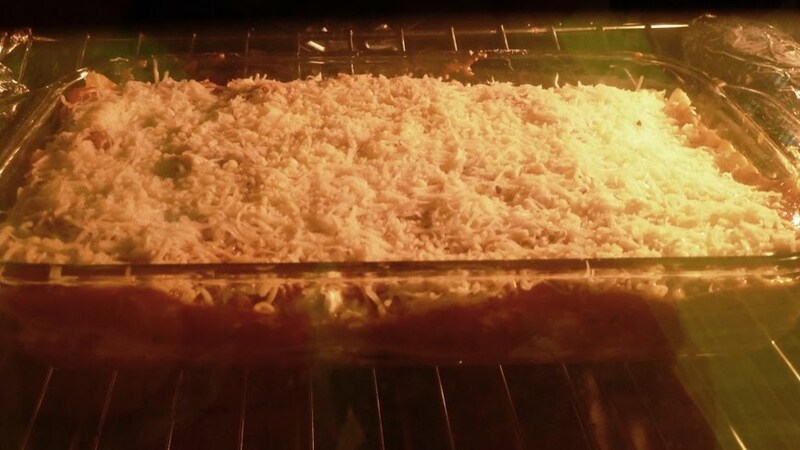 Then I added another layer of lasagna noodles, again followed by pasta sauce & chicken/cheese. For my last pasta layer....I had ran out of the chicken/cheese mixture....so I just topped off the final pasta layer with sauce and then spread a generous serving of mozarella and parmesan cheese on top. My oven had been preheated to 350F......I cooked my lasagna for approx 45-50 min in total. Do check on it after 1/2 hour or so of baking 'cos the cheeses on top might burn. If you see that happening....grab some aluminium foil and use it to cover your lasagna so that it can continue to cook without the top layer being burnt. Here's my lasagna....ready to be eaten! Anything-goes cooking is fun. Try it and share with us your results.